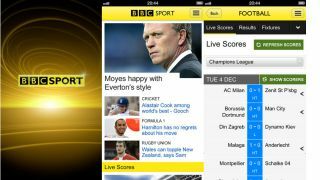 The BBC Sport iPhone app has been updated, enabling live video and on-demand shows. You can watch all of the BBC's live sporting events and shows like Match of the Day on your phone through the app (just as you can with BBC iPlayer, we know). Other events coming up include F1, the Six Nations, and Wimbledon. But it's not just iPhone owners who can enjoy the videos: the BBC Sport mobile website will now show clips too. So anyone with a smartphone can get involved using their browser. Android users can get in on the fun using the BBC Media Player app, available on Google Play. The BBC Sport app for iPhone launched a couple of weeks ago. It works with all versions of iPhone currently on sale as well as the 3GS, iPod touch, and iPad. It's optimised for the iPhone 5. As well as live updates, it'll bring you daily text commentary from BBC journalists, football tables and fixtures, and you can customise it depending on your favourite sport.